モーツァルト:セレナード第12番 ハ短調, K.388 (384a) "ナハトムジーク"
WEMBLEY. THE METAL RESISTANCE STARTS HERE! THE TIME has come to start taking BABYMETAL seriously.Tonight,the Japanese teenage trio confidently steer clear of any suggestion that their hyperactive mix of roaring speed metal and cavity-creating J-pop might be little more than a fad, with a relentlessly engaging and emotionally-charged hour-and-a-half spectacle. 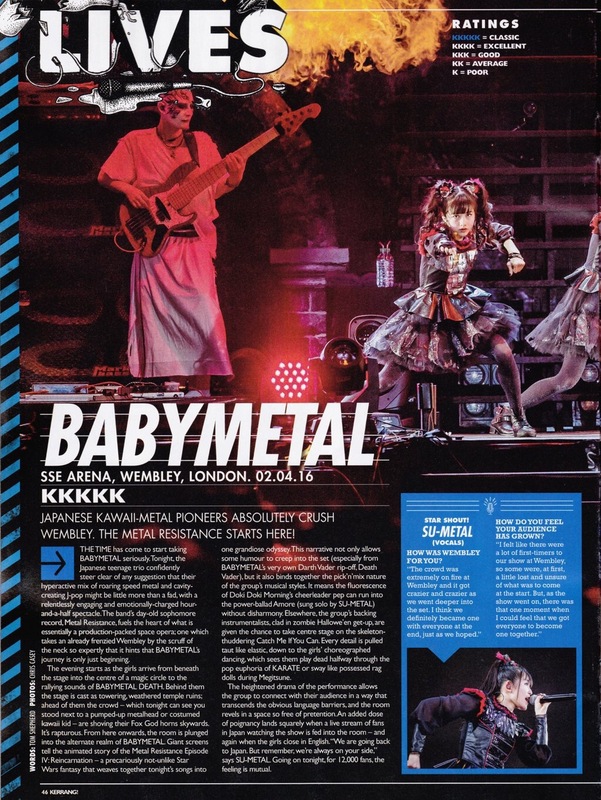 The band's day-old sophomore record,Metal Resistance,fuels the heart of what is essentially a production-packed space opera;one which takes an already frenzied Wembley by the scruff of　the neck so expertly that it hints that BABYMETAL's journey　is only just beginning. The evening starts as the girls arrive from beneath the stage into the centre of a magic circle to the　rallying sounds of BABYMETAL DEATH. Behind them the stage is cast as towering,weathered temple ruins; ahead of them the crowd - which tonight can see you stood next to a pumped-up metalhead or costumed kawaii kid - are shoving their Fox God horns skywards. It's rapturous. From here onwards,the room is plunged into the alternate realm of BABYMETAL. Giant screens tell the animated story of the Metal Resistance Episode IV: Reincarnation - a precariously not-unlike Star Wars fantasy that weaves together tonigh's songs into one grandiose odyssey. This narrative not only allows some humour to creep into the set (especially from BABYMETAL's very own Darth Vader rip-off,Death　Vader), but it also binds together the pick'n'mix nature of the group's musical styles. It means the fluorescence of Doki Doki Morning's cheerleader pep can run into the power-ballad Amore (sung solo by SU-METAL)without disharmony. Elsewhere,the group's backing instrumentalists,clad in zombie Hallowe'en get-up, are given the chance to take centre stage on the skeleton-thuddering Catch Me If You Can. Every detail is pulled taut like elastic,down to the girls' choreographed dancing,which sees them play dead halfway through the pop euphoria of KARATE or sway like possessed rag dolls during Megitsune. The heightened drama of the performance allows the group to connect with their audience in a way that transcends the obvious language barriers,and the room revels in a space so free of pretention. An added dose of poignancy lands squarely when a live stream of fans in Japan watching the show is fed into the room - and again when the girls close in English. "We are going back to Japan. 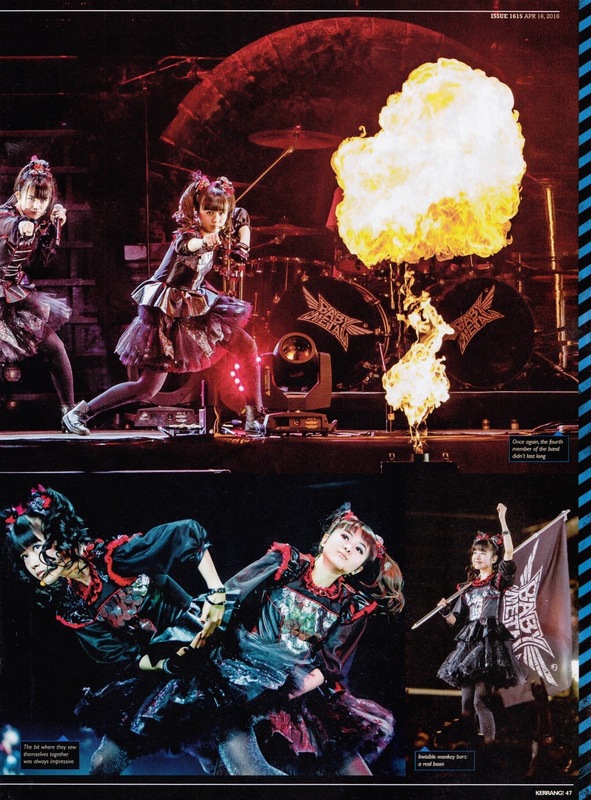 But remember, we're always on your side,"says SU-METAL. Going on tonight, for 12OOO fans,the feeling is mutual. Life and Death,Beginnings and Ends,In this Infinite Loop,the spirit goes on living.